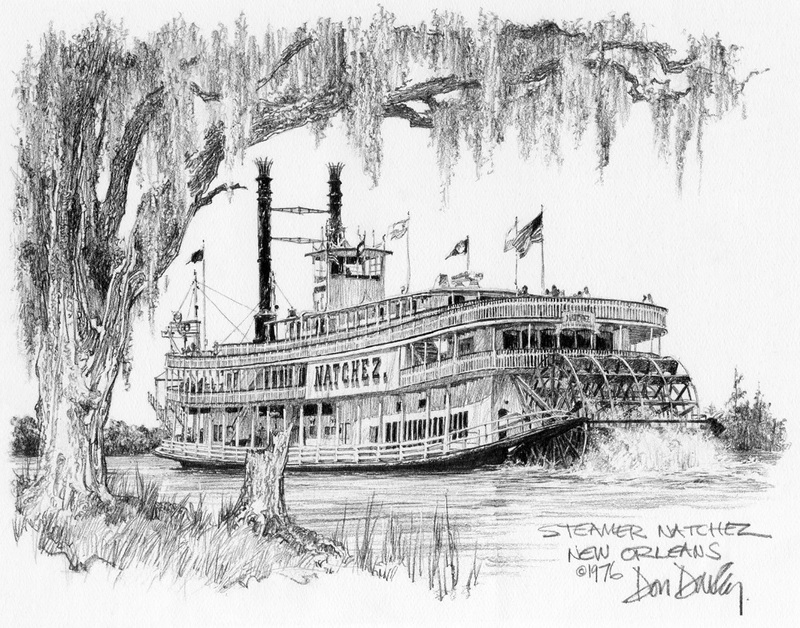 Attached scan of Don Davey's pencil sketch/drawing of the "modern" NATCHEZ steamboat which Doc Hawley was Captain of for quite a while. Don Davey began his distinguished career at the American Academy of Art in Chicago and the warmth and vitality of his drawings have won constant praise and recognition. His illustrations have lent sparkle to such magazines as McCalls, Saturday Evening Post and Fortune. While residing on the west coast he served on the faculty of the American Academy of Art in San Francisco and was instrumental in the formation of the Society of Illustrators which he served as president. On invitation of the United States Air Force, he toured the Orient in return for his subsequent painting presently on world tour and part of the permanent collection of the United States Air Force documentary art program. An award winning artist with both gold and silver medals to his credit, Mr. Davey's technique, at once factual and impressionistic, has won him a following the world over. The popularity of his work is best acknowledged by the public's acquisition of well over one million lithographs by collectors both here and abroad. A resident of New Orleans for seven years, he remains an avid and enthusiastic traveler. Recently returned from a painting trip of Europe and Polynesia, Mr. Davey is constantly in search of new subject matter unique to the area he is exploring. His beautiful and impressive collection of treasured landmarks presently includes Chicago's Old Town, California's Monterey Peninsula, San Francisco, Louisiana plantation homes, New Orleans and Hawaii. If your favorite store cannot supply you, write Colony Publishing Inc., 615 Montgomery, San Francisco, California 94111. "My purpose as an artist is to communicate my own visual and emotional response to the old world atmosphere of this historic city, to share with the viewer my own intimate impressions, and to see through the inner eye of the artist the tranquil beauty of the stately St. Louis Cathedral, the sun casting fragile shadows on wrought iron lacework, the sculptured textures of weathered old buildings and courtyards, and to awaken visual memories of your visit so that the past, momentarily reborn, becomes the present." This book was reviewed in the NY Times on March 30, 1907 under the headline FROM MISSOURI . . . 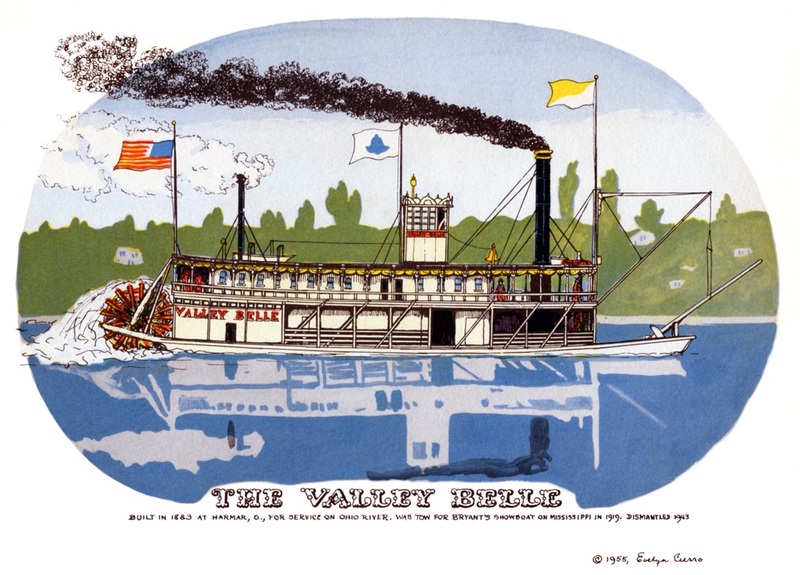 The True Adventures and Wise Observations of Sam, a Boy of the Steamboats"
The narrator is a boy named Sam Daly whose ". . .congenial stomping ground is upon Missouri and Mississippi River steamboats and the rafts and landings from Cairo to New Orleans. The period is somewhat subsequent to that already made famous by Mark Twain." 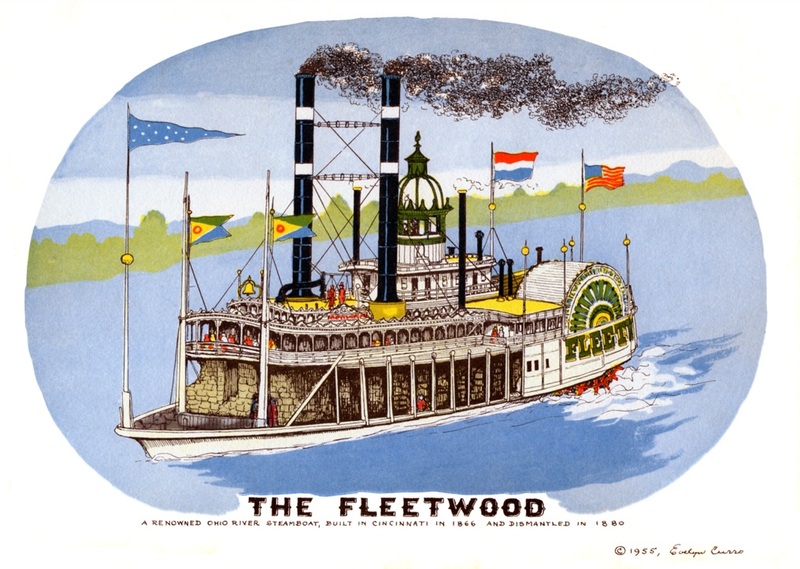 "The narrative drifts care-free like the river upon whose bosom it floats, with eddies and resting places on the bank, the rollicking song of the 'coonjiners' (Missouri for coal passers) weaving itself into a tune with ripple of the waters and accompanying as a supporting orchestra the treble of the young troubadour's tale." It would be interesting to know what Sam Clemens himself thought of this book since he very probably read it. 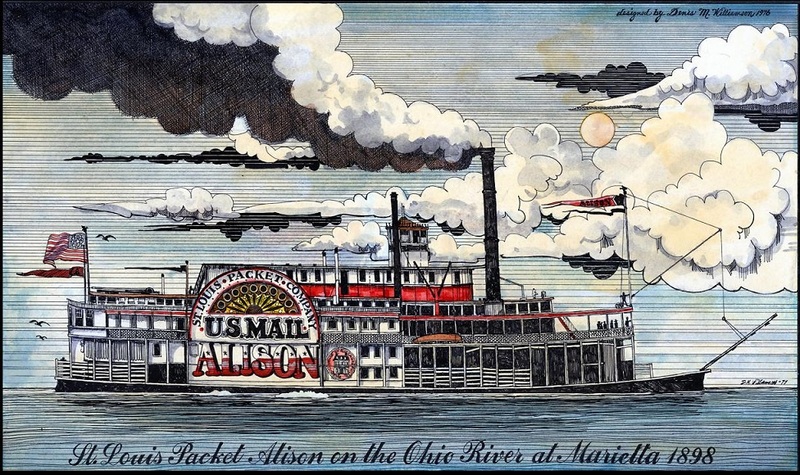 "St. Louis Packet Alison on the Ohio River at Marietta 1898"
9 1/2 X 16 1/4 pen and ink & watercolor painting with a coat of lacquer over the surface. The ink lines are exceedingly fine so this is more likely a very good print from a larger original pen & ink graphic rather than the original itself. The lacquer gives it a yellowish cast in the areas that would have been white otherwise. The scanner color-corrected the hues to "normal." 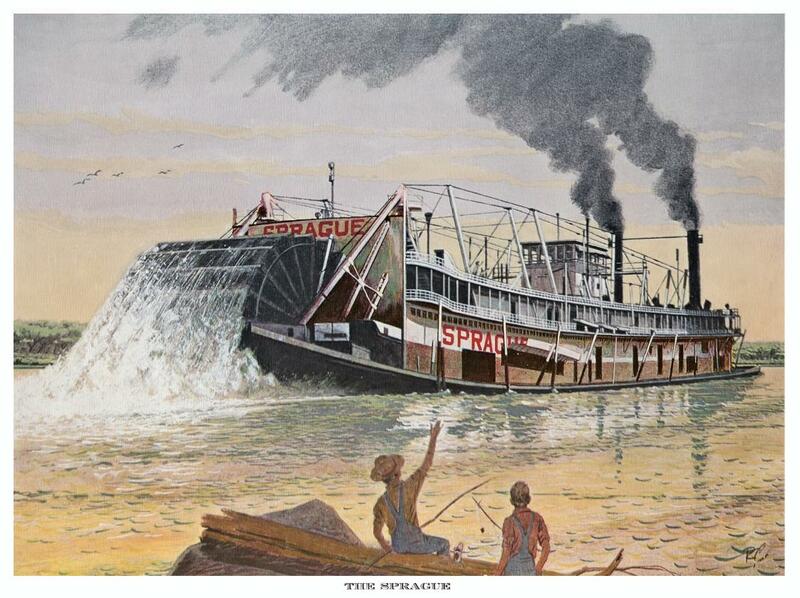 A St. Louis packet on the Ohio at Marietta in 1898 would've been a long way from home. 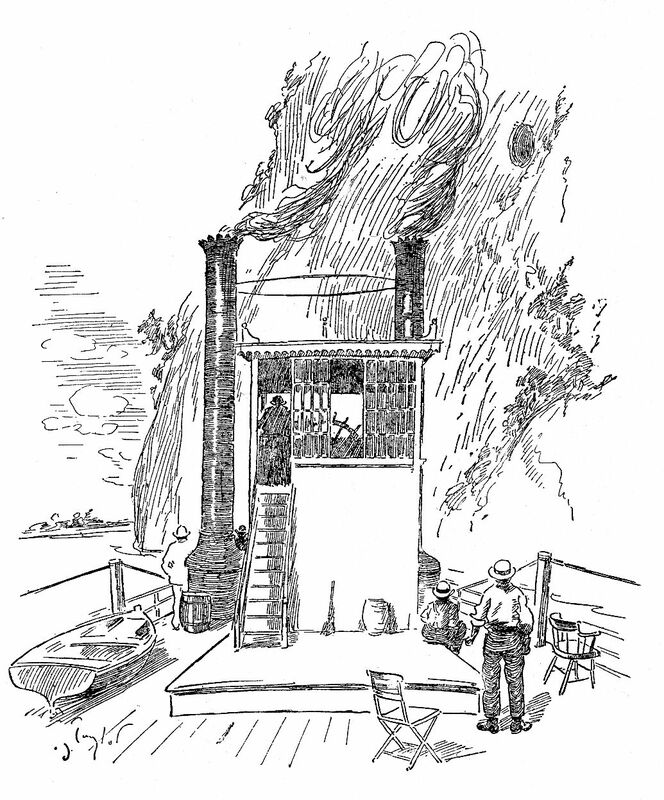 The artist included a pen and ink logo to the right of the paddlebox: HOUSE ON GALLEGHERVILLE ROAD (which is in DOWNINGTON, PENNSYLVANIA) which may have been the where Denis Williamson's home and/or studio were located. The antique dealer I purchased this from is located in Denver, Pennsylvania 36.4 miles (46 minutes) northwest of Downington. 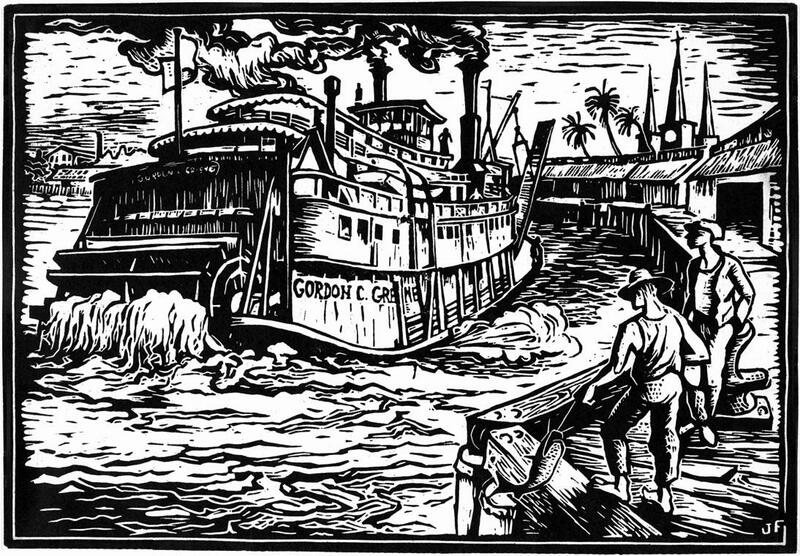 The GORDON C. GREENE in a woodcut entitled "Dumaine Street Dock"
The steamboat GORDON C. GREENE is the star attraction in this undated woodcut approximately 7 1/2 x 11 inches printed on yellowing wood pulp paper. Margins on the top and left and right sides were trimmed to fit inside a stock frame. Entitled "Dumaine Street Dock" (New Orleans) by Jim Fisher who could have possibly been the James A. Fisher listed as having exhibited at the New Orleans Art League and the Orleans Gallery Collection. If any of our visitors can provide information on the Jim Fisher who created this artwork please let us know. The St. Louis Cathedral at Jackson Square is represented in the upper right. In the lower right foreground a fisherman stands on the dock in front of a row of warehouses as he pulls a catfish that he's caught out of the Mississippi. A second fellow stands idly by. 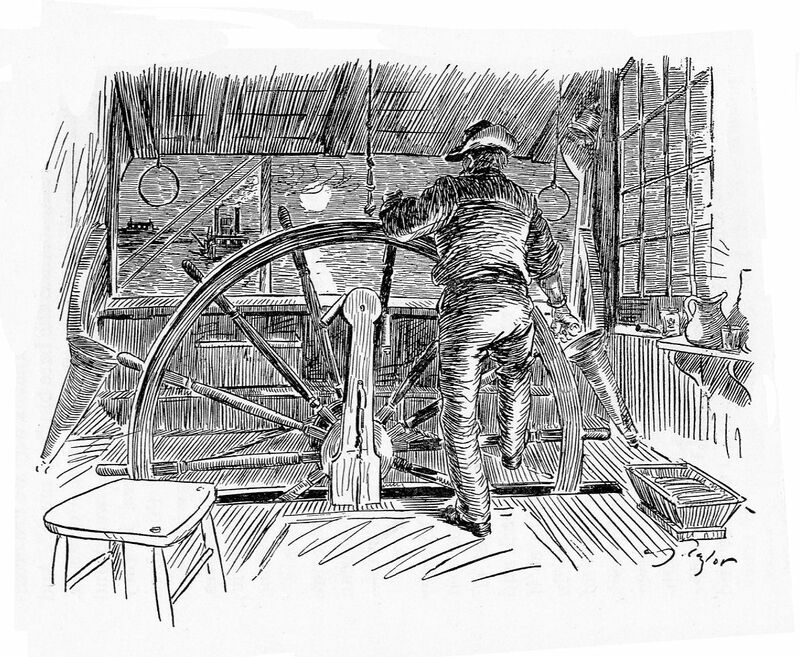 SPRAGUE illustration, artist's initials "R.C." 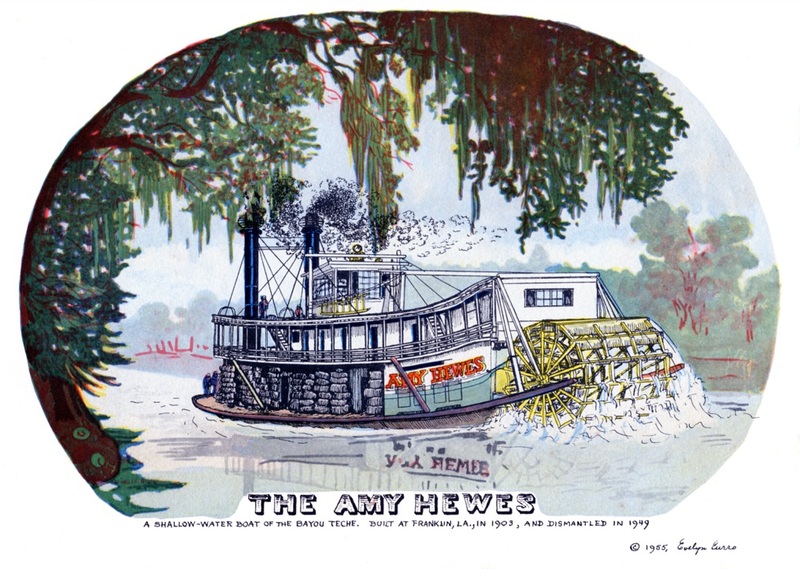 A half dozen 8-1/2" X 6" color prints representing Mississippi and Ohio River boats, large and small; plus several from the shallow, and rough water boats of the Missouri River and Bayou country. In the original "suitable for framing" little bound book there were a dozen boats including some from the West and East coasts. 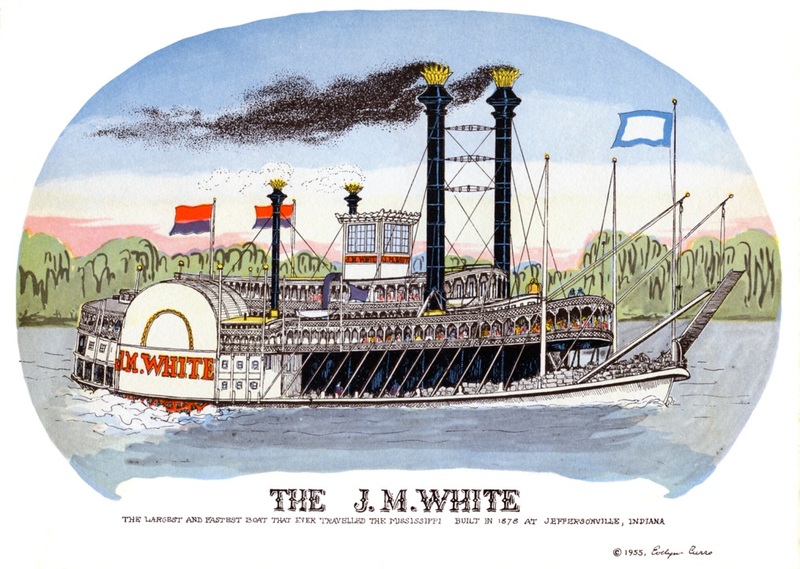 The attached scans of Western Rivers-style boats are my favorites. Evelyn Curro, an artist whose quaint Americana drawings of San Francisco cable cars and Victorian homes belied a feisty spirit and salty tongue and who, late in life, charmed pig farmers in Portugal while whacking other locals with her cane, died on March 5 at the age of 97. She was at her home in southern Portugal. Mrs. Curro lived a full and adventuresome life, from her birth in Indian territory near Spokane, Wash., to her time working for a sportswriter in Mexico and living in San Francisco, to her final years in Portugal. The sense of bravado was apparently part nature, part nurture. She was born Evelyn Rose Malone in 1907 and grew up in a silver mining camp near Wallace, Idaho. Her mother, a widow, had moved there to start a school for the children of miners working at the Sunshine Silver Mine. When her mother died of a heart attack at age 49, Evelyn Malone, then 23, was in charge of her 5- year-old half-sister, Mary Jane Murray. "The nuns came to take away Mary Jane, and my mother wouldn't hear of it, " said Mrs. Curro's daughter, Marta Curro. "She said they had relatives in South America. So, that's where they went." Evelyn Malone later moved to Mexico City, where she met her future husband. Anthony Curro was an American prizefighter visiting Mexico, and she was a translator for a local sportswriter. She reportedly became so incensed by a remark Curro made that she took to be sexist that she zeroed in on his beloved Panama hat. "My mother took a bottle of seltzer water and sprayed his hat until it was straw rings," Marta Curro said. "My father used to tell me, 'Kid, that's when I made the mistake of my life and said, "Why don't we discuss this over lunch?" ' "
The prizefighter apparently didn't know what he was up against, Marta Curro said with a laugh. At the time her mother was working as a translator, her Spanish was terrible. "She had the guts of a burglar," Marta Curro said. The Curros' 10-year marriage was marked by low blows and high drama. "They were both extremely beautiful people," Marta Curro said. "All they seemed to do was fight. We used to live between Geary and Clement. She would take his boxing stuff and dump it in the park. He would go and retrieve it and then kick in her paintings." For many years while living in San Francisco, Mrs. Curro poured her considerable energy into drawing. 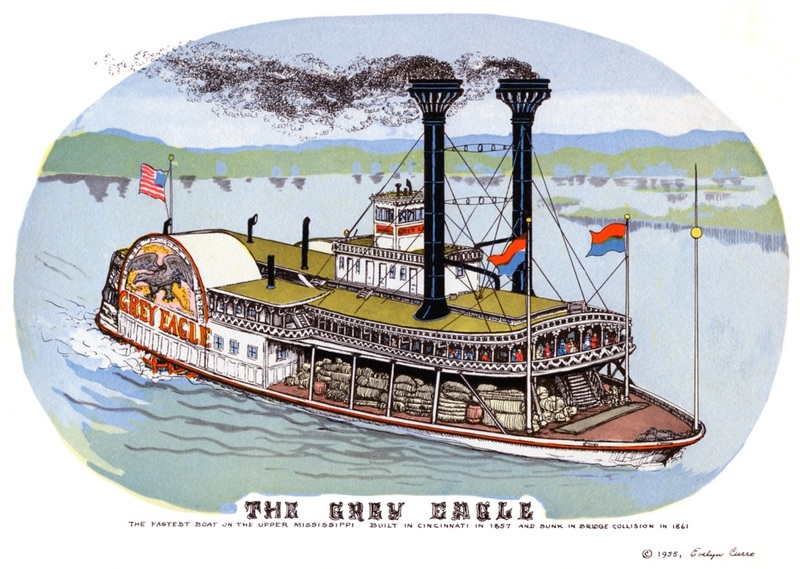 She became known as a cable car artist, but she also drew Victorian architecture, fire engines, railroad cars, circus wagons, antique cars and paddle-wheel steamboats. 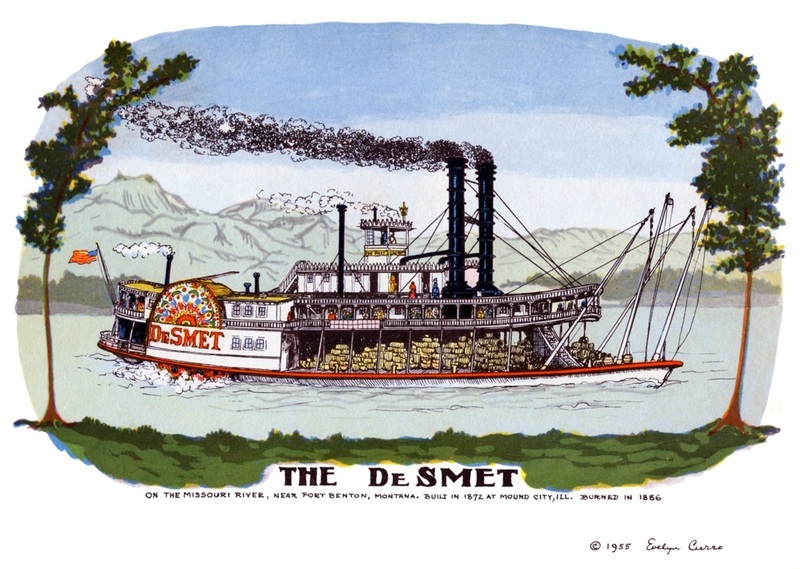 Her pen-and-ink cable car prints are available at the Cable Car Museum in San Francisco. "The appeal of her work is the nostalgia," said museum manager Jose Godoy. "They are images you don't see today." Marta Curro says she grew up never knowing her mother was "flat broke." "My mother always made things fun," she said. "We'd go to this shop on Market Street where a person played sheet music all day. When the person would go on lunch break, my mother would sit down at the piano and play what she called 'whorehouse piano.' I was mortified, but people loved it." Marta Curro also said she and her mother would always buy their Christmas tree on Christmas Eve&when prices went down. "I just thought it was special," she said. "We'd string popcorn and cranberries." In 1970, Mrs. Curro's work was published in a book called "The American Eye of Evelyn Curro." The same year, Mrs. Curro moved to Portugal. She had visited before and felt it had the magic of San Francisco, without the high prices. At that time, her daughter was married to the late Jerry Orbach, the actor who would become best known for his TV role as detective Lennie Briscoe in "Law & Order." Orbach reportedly went out of his way to help his mother-in-law, especially when it came to getting her out of the country. "My mother had 17 cats with her, and Jerry paid to have a crate made so she could take all the cats with her," Marta Curro said. "I remember Jerry celebrating my mother's departure by buying a round of drinks for the house." Mrs. Curro moved to Portugal without knowing a soul. She had bought an old chicken farm for $10,000 and "turned it into a showplace," said Marta Curro. She quickly made friends with neighboring farmers and became legendary for her frankness. If she liked someone who was in need, she would hand over what little money she had. When she felt affronted by someone, out came the cane. She put up with little nonsense, her daughter said. "She always had the sense of, just pull yourself up and get moving," her daughter said. "She was really a happy person. My mother taught me that cheerfulness is a kind of grace. It didn't matter what went on in your life. If you were going to dump it on someone else, you may as well stay home." "She was happiest in San Francisco," Marta Curro added. "She always referred to that as her home."